Key Difference: Nausea is a feeling of physical unwellness, usually with the desire to vomit. On the other hand, hunger is a need or compelling desire for food. Wikipedia defines Nausea as, “a sensation of unease and discomfort in the upper stomach with an involuntary urge to vomit.” The word nausea has been derived from word ‘nausia’, meaning motion sickness. Nausea does not have a specific symptom, which means that it has many possible causes. Nausea basically is a sickness of the stomach that occurs after having food. It especially happens by a strong dislike/disgust or bad feeling that may lead to an impulse to vomit. Wikipedia defines hunger as, “the physical sensation of desiring food.” From many years, the international price of food is rising rapidly. The hunger is also suffered by those who all are living in the advanced economies such as Great Britain, the United States, etc. 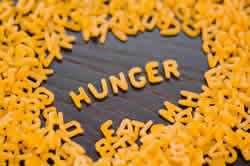 Hunger basically is an indication that one needs food to fill his stomach for a particular period of time. It is not a one time activity, it means one is hungry after a certain period of time and needs to fulfill his physical sensation of desiring food. Sickness at the stomach, especially when accompanied by a loathing for food and an involuntary impulse to vomit. A compelling need or desire for food. The painful sensation or state of weakness caused by the need of food: to collapse from hunger. A shortage of food; famine. A strong or compelling desire or craving: hunger for power. Making bad food choices which can lead to poor health and possible weight gain. Intensely craving for junk food like burgers, ice-creams, etc. Symptoms of motion sickness include nausea, dizziness, cold sweats and headaches. However, she finds herself suddenly overcome with nausea. Nausea and vomiting, certain ones are more liable to do so. What is the problem with you: Nausea, stomach ache, diarrhea or constipation? He has also complained of some nausea and diarrhea. And some families already weakened by hunger have lost everything to floods. Hunger for righteousness, not to fill their bellies. Relationship of hunger and food insecurity to food availability and consumption. Now the danger is far more for real-thousands of villagers have no water or food, and through some sources it has been reported that hunger are widespread.